Poppy seed is an oilseed obtained from the poppy (Papaver somniferum). The tiny kidney-shaped seeds have been harvested from dried seed pods by various civilizations for thousands of years. It is still widely used in many countries, especially in Central Europe, where it is legally grown and sold in shops. The seeds are used whole or ground into meal as an ingredient in many foods – especially in pastry and bread – and they are pressed to yield poppyseed oil. 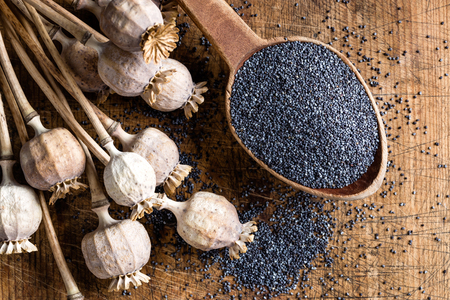 The poppy seed is mentioned in ancient medical texts from many civilizations. For instance, the Egyptian papyrus scroll named Ebers Papyrus, written c. 1550 BC, lists poppy seed as a sedative. The Minoan civilization (approximately 2700 to 1450 BC), a Bronze Age civilization which arose on the island of Crete, cultivated poppies for their seed, and used a milk, opium and honey mixture to calm crying babies. The Sumerians are another civilization that are known to have grown poppy seeds. In 2016, world production of poppy seeds was 92,610 tonnes, led by the Czech Republic with 31% of the world total, followed by Turkey and Spain as other major producers (table). The poppy seed harvest can be a by-product of cultivation of Papaver somniferum for opium, poppy straw, or both opium and poppy straw. However, harvesting for poppy seeds of superior quality is in conflict with harvesting for opium as poppy seeds should be harvested when they are ripe, after the seed pod has dried. Traditionally, opium is harvested while the seed pods are green and the seeds have just begun to grow and their latex is abundant. Poppy straw can be a by-product of cultivation of poppy seeds. Compared to the seed pod and straw, the seeds contain very low levels of opiates. The seeds may be washed to obtain poppy tea but a large amount is needed, around 300-400g depending on the levels of opiates. In a 100 gram amount, poppy seeds provide 525 Calories and are a rich source of thiamin, folate, and several essential minerals, including calcium, iron, magnesium, manganese, phosphorus and zinc (table). Poppy seeds are composed of 6% water, 28% carbohydrates, 42% fat, and 21% protein (table). Whole poppy seeds are widely used as a spice and decoration in and on top of many baked goods and pastries. In North America they are used in and on many food items such as poppyseed muffins, rusk, bagels (like the Montreal-style bagel), bialys, and cakes such as sponge cake. Poppy seeds can also be used like sesame seeds, added to hamburger buns or to make a bar of candy. The bars are made from boiled seeds mixed with sugar or with honey. This is especially common in the Balkans, Greece and even in the cuisines of former Austro-Hungarian countries. The color of poppy seeds is important in some uses. According to The Joy of Cooking, "the most desirable come from Holland and are a slate-blue color." When used as a thickener in some dishes, white poppy seeds are preferred, having less impact on the color of the food. In other dishes, black poppy seeds are preferred, for maximum impact. Blue poppy seeds are used in various German breads and desserts as well as in Polish cuisine. The poppy seed paste is used for fillings in pastries, sometimes mixed with butter or milk and sugar. The ground filling is used in poppy seed rolls and some croissants and may be flavored with lemon or orange zest, rum and vanilla with raisins, heavy cream, cinnamon, and chopped blanched almonds or walnuts added. For sweet baked goods, sometimes instead of sugar a tablespoon of jam, or other sweet binding agent, like syrup is substituted. The poppy seed for fillings are best when they are finely and freshly ground because this will make a big difference in the pastry filling's texture and taste. Poppy seeds are pressed to form poppyseed oil, a valuable commercial oil that has multiple culinary and industrial uses. Poppy seeds are often used as bird seed, in which case they are usually called maw seeds. Across Europe, buns and soft white bread pastries are often sprinkled on top with black and white poppy seeds (for example Cozonac, Kalach Kolache and, Kołacz). The seeds of the czech blue poppy (food safety cultivars Papaver somniferum) are widely consumed in many parts of Central and Eastern Europe. The sugared, milled mature seeds are eaten with pasta, or they are boiled with milk and used as filling or topping on various kinds of sweet pastry. Milling of mature seeds is carried out either industrially or at home, where it is generally done with a manual poppy seed mill. Blue poppy seeds are widely used in Austrian, Croatian, Czech, German, Hungarian, Lithuanian, Polish, Romanian, Russian, Serbian, Slovak, Turkish and Ukrainian cuisines. In Central Europe, poppy strudel is very popular, especially during Christmas. In Germany, Poland and countries belonging to the former Austro-Hungarian Empire, poppy seed pastries called Mohnkuchen are often eaten around Christmas time. Recipes for Mohnstriezel use poppy seed soaked in water for two hours or boiled in milk. A recipe for Ukrainian poppyseed cake recommends preparing the seeds by immersing in boiling water, straining and soaking in milk overnight. In Indian cuisine, white poppy seeds are added for thickness, texture and flavor to recipes. Commonly used in the preparation of korma, ground poppy seeds, along with coconut and other spices, are combined into a paste added during cooking. Poppy seeds are widely used in many regional Indian cuisines. One dish is aloo posto (potato and poppy seeds) which consists of ground poppy seeds cooked together with potatoes and made into a smooth, rich product, which is sometimes eaten with rice. There are many variants to this basic dish, replacing or complementing the potatoes with other ingredients, such as onions (pnyaj posto), pointed gourd (potol posto), Ridged Luffa (jhinge posto), chicken (murgi posto), and prawns (chingri posto). Chadachadi is a dish from Bengali cuisine and includes long strips of vegetables, sometimes with the stalks of leafy greens added, all lightly seasoned with spices like mustard or poppy seeds and flavored with a phoron. One dish involves grilling patties made from posto, sometimes frying them (posto-r bora). Another dish involves simply mixing uncooked ground poppy seeds (kancha posto) with mustard oil, chopped green chili peppers, fresh onions and rice. Eating large quantities of poppy seeds can cause a phytobezoar which can block the bowels. But, if the seeds are consumed in moderation as an ingredient in cooked or baked foods, phytobezoar formation is very unlikely. Allergy (type 1 hypersensitivity) to poppy seeds is rare, but has been reported and can cause anaphylaxis. To minimize the problems caused by false positives for competitive athletes, the USADA recommends that competitive athletes refrain from eating foods containing poppy seeds several days prior to a competitive event.